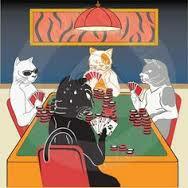 Why Don’t Cats Play Poker in the Jungle? Being the responsible parent that I am, I was teaching my kids how to play poker on a rainy Saturday afternoon. Poker with four cats is difficult and annoying but also really fun. They climbed on the table, swatted at the cards and attempted to tip the poker pot. Kids, cats, and poker are a bad combination if you are being too serious but we enjoyed it. None of us are ready to go tour the poker circuit. Well, maybe the cats are. They have some cool poker faces.